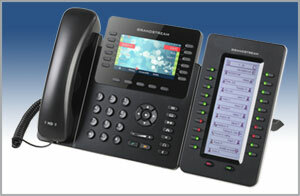 The GXP2170 is one of the most powerful IP phones that Grandstream has released to date. It’s packed with features and easy-on-the-eyes. To start, the GXP2170 supports an impressive 6 SIP accounts for maximum flexibility, allowing you to have business presence in multiple locations. The 12 line keys/line appearances work with the device firmware to provide up to 48 on-screen presence indicators or BLFs. This enables you to be much more efficient and productive redirecting and responding to calls. Add up to four GXP2200 EXT modules to max out your phone with 160 presence indicators. The 4.3 inch 480×272 pixel colour screen makes for great legibility, and accents the attractive design. The GXP2170 would look great on any desk. The phone also features dual Gigabit Ethernet, integrated PoE and Bluetooth for syncing with blue-tooth headsets. And it supports up to 5-way conferencing. With its high-end features and expandability, the GXP2170 is ideal for executive assistants, call centre managers, power users or any executive who appreciates a well-designed device.